This Dodge G13/HCB Pump belongs to the Defence Fire Service at Donnington (England). I think that Dodge was bought by Renault a time ago. But nice picture Iain. Added by Marcel Sloover on 25 August 2005. Added by on 25 August 2005. I would have to agree with the person that has sent you this comment, I know a little about fire vehicles, and yes in this photo the vehicle shown does look like a Dodge. Added by unknown on 19 October 2005. Added by John O Donoghue on 27 November 2005. Why does the Defence Fire Service always go for very odd, almost one off appliance designs? This must be an expensive way to procure machines. Surely it would make greater economic sense to tag the MOD requirement onto a big long term civilian contract like the previous London Volvo/Saxon one. Or do DFS pumps have such unique requirements that they are entirely unlike normal domestic pumps? Added by Tim Wingham on 09 April 2008. Added by BLACK MAFFIA on 18 May 2008. Aren't the bodies re-chassied whenever possible?. This would explain why it appears odd. It's also a Renault G13 ( Dodge ) cabbed chassis. Added by Stevie Murray on 18 May 2008. I'd be surprised if MOD goes for rebodying. As BLACK MAFFIA implys it's probably cheaper to add a separate body to an "as delivered cab chassis", hence the looks. Added by Tim Wingham on 19 May 2008. Is that not what all modern UK fire appliances are(including Dennis), except the cabs are often built to fir the exisiting cab better? Added by Lewis Sweeney on 20 May 2008. Yes, that's what makes this example odd, (and ugly). It has a standard cab, not a crew cab -ie- the crew compartment is part of the body, which is not coachbuilt integrally with, or close to the body. Presumably less work for the bodybuilder, less cash from the buyer, and zero communication between those up front and those in the back! If this one's still on the run spares must be difficult to find, as both the Dodge G13 and HCB Angus are both sadly long gone. Or does MOD hold vast stocks of relevant spares? Added by Tim Wingham on 20 May 2008. I believe these appliances are now off the run and replaced by Volvos? Added by Stevie Murray on 20 May 2008. Interesting comments on the MOD. When in the RAF I suffered the Mk 8 airfield foam tender, Bedford RL body and engine, Jaguar pump engine and lockers had to be open to stop the Jag overheating! Yes they build to budget with a few exceptions, whoever thinks these machines up isnt a fireman! Added by John stott on 30 September 2008. Added by Layton Toward on 06 November 2008.
this was on station at kineton wen there second away volvo's water tank split. My mate who's stationed there said year's ago the army brought truck chassis's and throw the body onto it.Its real high of the ground and they couldn't wait to see the back of it. Added by Tg on 06 November 2008. It would appear that this appliance is now up for sale on the witham-sv site. Added by Nathan on 31 December 2008.
this app was back at kineton as there 1st away was having something done. seams like the old girl just keeps going and the engine run's like a dream. Added by TG on 16 January 2009.
this car is look like a BMC Fire engine from Tukshy. Added by Florian on 21 February 2009. I think the bodies are a standard design,possibly rebodied, RAF Sealand had a WrT a Bedford TL chassis cab with an identical crew/kit body on the run in late 90's. Added by Gary Simpson on 11 December 2009. We now own this vehicle and it is in very good condition, with very low mileage. An operating manual would come in very handy if anybody has one. Added by Paul Moulds on 14 June 2011. The original Ford D series in 1966 also used the factory tilt cab. The rear window was taken out and replaced by a rubber shroud to keep the rain out. There was no problem for the OIC to talk to the crew, and the rear cab offered more headroom and seat width than the coachbuilt extended four door tilt cabs on later versions. The 13.5 meter ladder could also be accommodated in a way which allowed the standard Ford cab to be tilted to check levels. Admittedly very ugly, but less expensive and entirely practical. Added by Rob Johnson on 16 June 2011. I thinl the 1st modern Ford to appear was the Merryweather Marksmanabout 1970 Lancs had a batch of 10 or 12 then went onto the mass produced ones. Am I right in thinking Glousteshire were the only brigade to run the low cost cab? Added by Neal Glover on 16 June 2011. Gloucestershire bought the first ones - I think there were eight. These were petrol D600s. Other brigades later bought either D600s or diesel D1014s, but I am not sure about bodybuilders. Carmichael built a few D series with their own cab, also used on Commer, Dodge and Albion chassis, so the whole spectrum was covered. D series TLs and Snorkels used the standard 2 door cab, as did Gloucestershire's original foam tender. Some D series were also built under license in Turkey and used as fire trucks, but I never heard of any of them having crew cabs. Added by Rob Johnson on 17 June 2011. 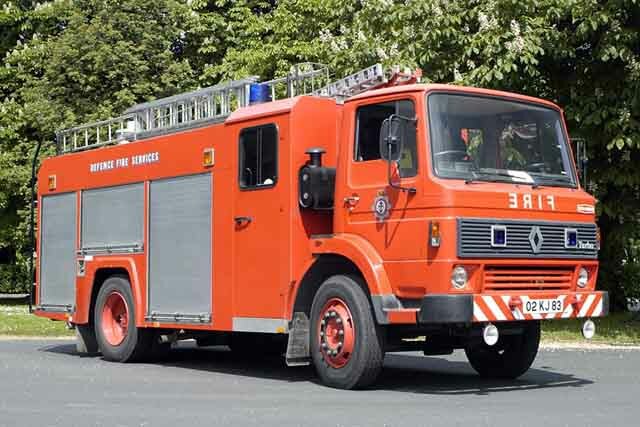 The ex RAF Sealand appliance to this design is now preserved by Merseyside Fire Museum along with a salvage tender ex Liverpool salvage Cops this tender also had the same design crew cab separate from the front cab. Added by Dave Price on 18 June 2011. Any idea who built the bodywork as I have found the salvege tenders were built by a firm called HARWIN the one with the separate cab being a Bedford TL60 shown as a Bedford-Harwin and registered EKF395Y.the same firm did the bodywork on a number of ford salvage tenders as well but with intergrated crew cab. Added by Dave Price on 21 June 2011.